Any discounts available on your orders? Are Chinese herbs completely safe to use? Generally speaking Chinese herbs are safe to use; however, there is always the possibility of someone having an adverse reaction based on a person’s unique physiology. Occasionally, an extremely small percentage of people (perhaps 1-2%) will for unexplainable reasons have a negative reaction to herbs. Within the vast Chinese pharmacopeia there are a few herbs considered toxic; as a matter of safe business practice whenever a toxic herb is required in a TCM prescription we always substitute a safer non-toxic ingredient. 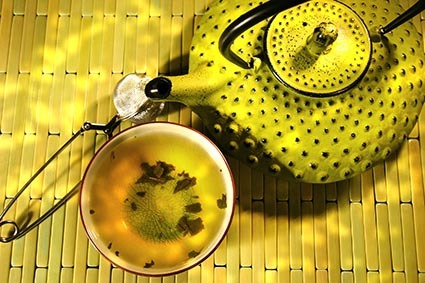 Can I add a sweetener to the herbal tea to improve the taste? Some do. We prefer to keep a bowl of yellow raisins handy, in case we run into a particularly nasty brew, we chew a few raisins which will clear the pallet of any unpleasant flavor. Can I take these herbs as well as my prescription medications and/or nutritional supplements? Generally speaking you can; however, we would prefer if you looked up your prescriptions or supplement online at webmd.com to be sure there are no contraindications listed. If you are at all uncomfortable, contact us. Do I leave the medicinal wine or liniment alone while it ages? During the first month (the beginning stage of aging) the vessel should be turned 2-3 times a week, but once a week thereafter. Yes. Please check with us in regard to the cost of shipment and custom regulations to your country. Regretfully, due to the higher cost of shipping internationally our domestic shipping rates do not apply. Some countries have restrictions on importing Chinese herbs; if you are not aware of your country’s restrictions please contact us prior to purchase. How do Chinese herbal formulas compare with Western herbal treatment? There are many differences; the most significant difference is the lack of side-effects found in Chinese herbs when compared to Western herbs. In traditional Chinese herbal medicine we always balance the ingredients in a prescription. If there is a harsh herb in a prescription, we balance that with a bland herb to level the affects. How do you cook ginseng? How does acupuncture compare with Chinese herbal treatment? Acupuncture is a good adjunctive therapy that can increase the effectiveness of herbal treatment. However, herbs treat on a deeper level than needle therapy. If I personally had to be treated, with one or the other, herbal treatment would be my choice. We believe that treatment with herbs alone in most cases has a stronger effect than the other way around. How often should I use a dit da jow? Basically, apply the jow as needed; however, some caution should be used as many dit da jows contain herbs that are not for internal consumption and as a safety measure we always suggest jows should be used for external application only. How does the aging process work? Once the herbs begin to soak or age in the alcohol solution the medicinal properties are extracted or drawn out by the alcohol. The spirit itself is considered to possess nourishing, blood invigorating properties that enhance the therapeutic effects of the herbs prepared with it. How long does it take to age a liniment? Although a minimum of 90 days is recommended, keep in mind, that the longer the jow ages the more potent it becomes (by that we mean its effects will be stronger if it ages longer). We generally prefer to age our jows 365 days. How long do I need to take the herbal formula? A majority of the formulas in this website are prescribed for short-term use as first aid medicine; however, some of the formulas require long-term use to experience the desired effects. In some cases those formulas are noted accordingly; if in doubt please call us. In general once a raw herb formula has been decocted it will last for approximately 2 weeks, patent formulas last approx. 8 days. How to prepare a decoction? The decocting process is the traditional form of herbal preparation. And, certainly anyone who has an aversion to alcohol and can’t drink a jiu, can decoct (or cook) the raw herbs in water the same way you would make tea. Here’s a link to step-by-step instructions on how to prepare a tang or herbal decoction. How to prepare a dit da jow/liniment? Jows are quite simple to make, the herbs are aged (or soaked) in a sweet rice wine, vodka or brandy for a minimum of 90 days or preferably until the herbs break down (almost dissolving) which can require as much as a year or two of aging. Traditionally the herbal jow was buried in the ground, allowing it to remain at a constant cool temperature. If that isn’t possible, cool and dark are the key words to remember. The amount of the herbs, exact size of the container and which spirit should be used will be determined by the formula being used; however, here’s a link to step-by-step instructions on how to prepare a jow. How to prepare a medicinal wine? How to use the powdered form? First choice would be to make pills or capsules; however, if you find the idea of making those too much of a bother, then we suggest blending 1 teaspoon of the powdered herb into your favorite smoothie, juice, or power shake, and do this 1-2 x daily (before eating food). We recommend using a smoothie because it will hide the taste of the powder well. I’m already using prescription drugs for my ailment should I take Chinese herbs to treat it as well? In many cases you can; however, always check first to see if there are any contraindications listed before taking prescriptions for the same illness at the same time. You certainly don’t want to overlap treatment. Our advice is to discuss your concerns with us or your general practitioner prior to beginning herbal treatment. Is there a website I can use to look up an herb’s side effects? Should I avoid eating any particular foods while I take Chinese herbs? This is not a concern with most formulas. If there are any foods to be avoided we would certainly indicate that on our order’s processing instructions. Sometimes a powdered formula has lumps in it, why? During preparation the herbs in your formula were grinded down into a fine powder. However, it isn't uncommon that due to the remaining moisture in the dried herbs, some of the herbs may form into small balls within the powder. If this has happened, feel free to crush the small balls with your fingers, close the bag, and shake it well to re-mix the blended herbs before use. The patent formula box says take the pills with warm water, why? The warm water helps to dissolve the pills; which makes them break down faster in the stomach and get into your system more quickly. What about Sulfur Dioxide in Chinese herbs? Although the great majority of our herbs are 100% chemical-free, some of the herbs (from fruit-sources) are routinely treated with sulfur by some wholesales, similar to how the dried fruits you’d find in local Supermarkets have been treated. This industry-wide practice with fruit-based herbs is done to avoid clumping and sticking which is caused by their sugar content, which makes the drying process difficult. Clumping is particularly an issue with fruit-based herbs that are powdered. If you are sensitive to sulfur, please let us know, and we will take extra measures to insure that when these fruit based herbs are an ingredient in your formula that a sulfur-free substitute is used. What are herbal capsules or pills? Although the decoction/medicinal wine process are commonly used when preparing herbal tonics, raw herb formulas can easily be made into pills or capsules. Many who find the whole decocting and aging process simply too much of a bother, can prepare their raw herb formula into pills or capsules. And, although assimilation is somewhat slower you can still be assured the formula will be just as effective as if it were prepared as a decoction or medicinal wine. What are the side-effects of Chinese herbs? In 99% of cases there are no side-effects with the exception being herbs such as Ma Haung (Ephedra) which will increase the heart rate. For safety reasons we do not use Ma Haung in any of our formulas. * Free shipping on orders of $125.00 is applied after any discounts have been applied. For order amount of $125.00+ there is no charge for shipping via Priority Mail; however, Express Mail Service while available for orders over $125.00 requires payment. Please inquire for price which is based on actual weight of package. What form of using Chinese herbs is better: medicinal wine? decoction? or pills? It’s an ancient practice of aging herbs in alcohol, oil, water or vinegar. The resulting herbal extract can be rubbed into the skin for treating strained muscles and ligaments, or to condition the body’s striking surfaces for iron palm training. What is a medicinal wine/Yao Jiu? The ancient practice of aging herbs in alcohol is the simplest and, by some accounts, the oldest method known for making medicinal preparations. The Chinese word Yao refers to medicinal and Jiu refers to any type of alcoholic beverage. It can refer to wine, sherry, brandy, or distilled liquor such as vodka. In ancient times medicine wine was made by adding raw herbs directly to fermenting rice wine which produced a crude form of herbal wine (called a bai jiu).In modern times, medicinal wines are aged (or soaked) in a prepared grain alcohol solution for several months to a year allowing the medicinal properties to be extracted making an herbal wine. What’s the difference between a jow (liniment) and a jiu (medicinal wine)? These are two different things, one is used internally and the other externally. While both age or soak herbs to draw out their medicinal properties; the jiu is a tonic that is consumed, while the jow is a liniment that is for hand conditioning, iron palm training, for sprains, pulled muscles, etc. We at seaofchi.com consider Chinese Herbology to be a sacred art for two important reasons: first because of herb’s incalculable contribution to the health and well-being of mankind, and secondly based on our belief that although in many cases it remains undiscovered, it is through botanical medicine that God has provided the means for curing all human afflictions. Our company has always been guided by this fundamental principle, and is mindful of the deep sense of respect and gratitude that is owed to nature for this magnificent gift. Why is there no free shipping on orders for raw herbs (sold by the pound)? For those who want to buy raw herb (a pound or more), due to the weight of the merchandise certain discounts do not apply, such as: free shipping and the above domestic shipping charges. The shipping fee on raw herb orders is based on the parcel’s actual weight, example: If you want 10 pounds of herbs, the box weight would be 11 pounds due to box weight and herbs. If you have any questions regarding the discounts available for raw herbs sold by the pound orders please contact us. Simply stated, tonics are herbal formulas that invigorate, strengthen, and improve bodily functions. In Chinese Herbology, there are two types: those that nourish enrich and improve blood circulation in the body, known as Blood Tonics; and those that increase strength, extend endurance and supplement the vital energy, called Chi Tonics. A traditional Chinese medicine decoction is the cooking process by which raw herbs are boiled in water and the resulting liquid (or tea) is used.It is very important to follow each step in the process correctly to achieve the desired effects. What is the best hand conditioner or iron palm formula? 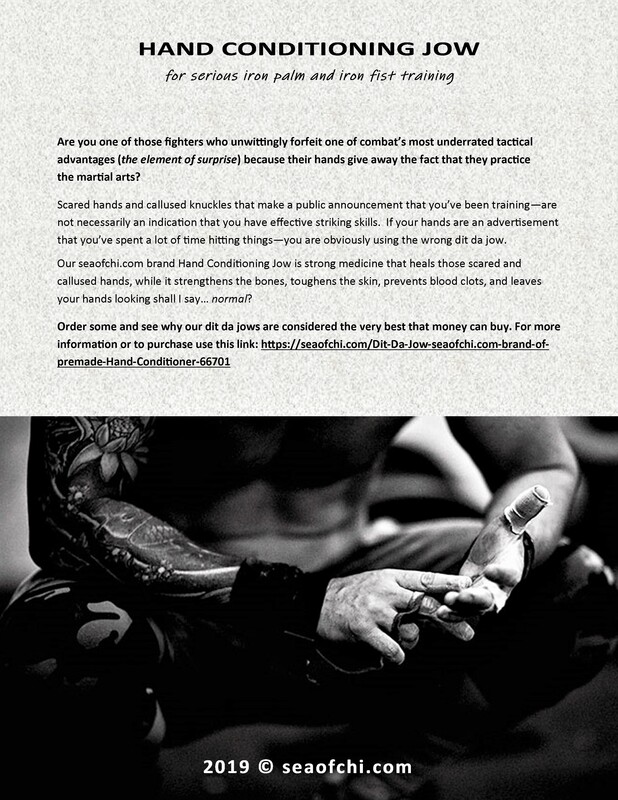 This is a question we’re frequently asked by martial artists, that really has no simple answer. Your choice of one formula over another is primarily influenced by two things: 1) the style of martial arts that you practice—there are formulas that are associated with a particular style that have an extensive history of use by practitioners of that style. Although other dit da jow are used by the styles practitioners, generally speaking a large percentage of them prefer using these traditional formulas. 2) is whether or not you practice internal arts like Ba Gua, Hsing Yi Chuan etc., or one of the external Karate or Gung Fu styles—formulas preferred by internal practitioners usually contain ingredients that focus more on cultivating and circulating chi in the extremities, while those that focus more on toughening the skin and hardening the bones are usually preferred by external stylist. What is the Sea of Chi? It’s the area on the human body approximately 1.5 inches below the naval that is more commonly known by its Japanese designation “Dan Tien.” The Chinese call the acupuncture point Qi Hai, which is located precisely one and a half chun below the umbilicus in this same area on the body… which translates to the ocean or sea of Chi. The name in our company’s official title Treasures from the Sea of Chi refers to the benefits or so-called “treasures” that one gains from lower abdominal breathing and energy circulation which are both specific to this unique anatomical area that is considered the reservoir where the vital energy (Chi) is stored in the human body. As raw herb formulas/prescriptions are prepared uniquely for each order (at the time of purchase to insure they contain only the freshest herbs) they are perishable and are non-refundable. However, raw herbs purchased by the pound, as long as the package is unopened and undamaged can be returned, and all unopened/undamaged patent formulas can be returned for a full refund, replacement, or credit. The shipping fee cannot be refunded. Refunds must be received back at seaofchi.com within 30 days of original purchase. What kind of container should I use to age the dit da jow? A large glass or porcelain jar, one that will hold between 1 and 5 gallons (exact size will depend on the requirements of the formula you are making). Be sure it has a cap, cork, or tight lid. Larger glass containers can be found in Target, Wal-Mart, Kmart, or online. What makes the traditional Chinese herb dit da yao better than Western “sports medicine” for treating martial arts injuries? Although both methods of treatment are useful for resolving acute symptoms and restoring functionality to an injured body part, generally speaking, Western sports medicine’s approach is more superficial and is known to have a much higher percentage of recidivism. A common complaint among ex-athletes whose injuries were treated with conventional western medicine is the recurrence of old injuries that return years later as the body ages. Traditional dit da yao therapy which is an empirical medical system developed over the course of many centuries, is specifically designed to treat martial arts injuries and heals on a deeper level which significantly reduces the likelihood of the recurrence of an injury in later years. There are also clinical reports stating that in cases where there is recurrence of an old injury treated with “Hit Medicine” it is usually less severe than injuries that were treated with Western therapies. All domestic orders will be shipped within 3 - 7 days via either Priority Mail or Express Mail. When can I expect to feel the effects of these herbs? Sometimes it can be within one or two days of use, sometimes it takes longer depending on the extent of the disease. Generally speaking within one month of use you should feel the effects; however, we recommend that you continue taking the prescription for at least 60-days to fully experience the benefits of treatment. That depends on which method of shipment you choose. It usually takes us 3 - 7 days to process an order, and Priority Mail takes an additional 3-5 days or Express Mail take 1-3 days to deliver. When you list several choices on a page, how do I know which prescription is best for me? The herbal formula that has the greatest number of indications that match your symptoms is what determines which formula is best. If you have any questions, always feel free to give us a call. Why are there so many little pills to take? It’s important to administer the proper amount of potency in each dosage, hence the seemingly large number of pills. Why do I need a definitive diagnosis of my symptoms (from my general practitioner) before you’ll tell me which prescription to use? We strongly recommend seeing a medical doctor for a comprehensive diagnosis of your symptoms prior to considering self-treatment. Having the definitive diagnosis allows us to have a better understanding of exactly what ails you, without it we would be treating you blindly (something we will not do). For those consumers with a life threatening illness or cancer, we suggest you see a Western medical doctor for treatment prior to considering self-treatment. Chinese medicine works very well in conjunction with Western medicine, and should only be used as an adjunct to Western treatment.